Every now and again I read an article online that gives an update of the statistics of YouTube. For example, in 2016 more than 300 hours of video were uploaded every minute, which obviously means that there is more content online than it is physically possible for any one person to watch. I’m okay with that as long as I can find what I need when I need it. However, it does make me think about the number of hours of content our students are watching – both for fun and for learning – and what that means for educators. Online content isn’t so different from print in that some of it is excellent and accurate and some is simply not. However, there is so much more of it easily at our fingertips and just as we teach students to become critically literate of the messages they read (and create) in print, we need to teach them to become digitally literate. If we want students to apply the knowledge they gain from digital environments, we must engage them. Simply posting a video for students to watch without any expectation that they will engage with the content or apply it will not result in learning. JISC has simplified their definition to ‘those capabilities which fit an individual for living, learning and working in a digital society’ and go on to explain that what it means to be digitally literate changes over time and across contexts. 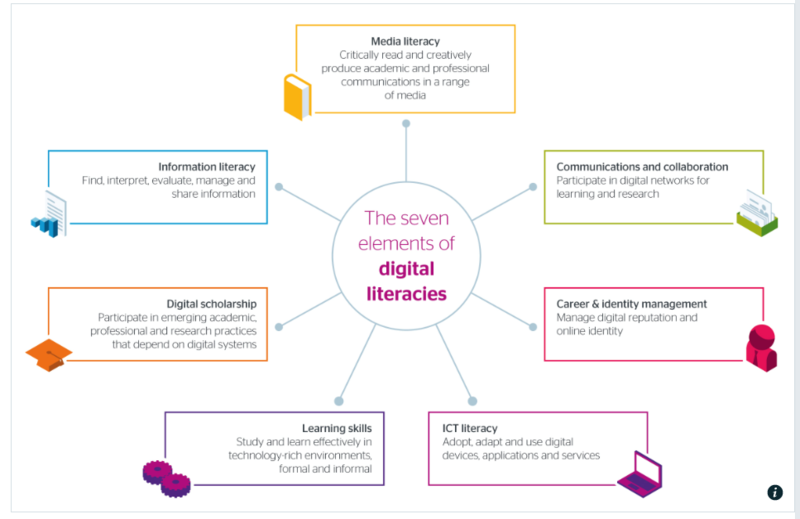 They created a Quick Guide to Developing Student’s Digital Literacy in 2015 that has some helpful information and a useful diagram they call The Seven Elements of Digital Literacies. The JISC guide also references a developmental model of student’s digital literacies from Beetham and Sharpe (2010). They describe the 4 developmental levels as access, skills, practices and attributes. However it is defined, digital literacy today is as important as reading and writing. Without it, students will not have the creative and innovation skills they will need to be successful in the rapidly changing economy of the 21st century.